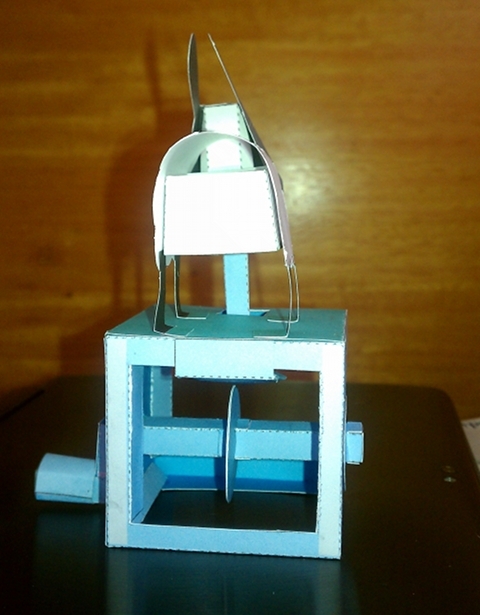 Continuing with the paper automata: After the first experiment with the Simple Crank Slider mechanism, I decided to try heavier card and a more ambitious model. Once again I went to Rob Ives’s site and downloaded a popular and apparently-simple project called Agreeable Sheep. This time I decided to try the heavier material and went with the 110 lb Premium Index Card stock. I also had to figure out how to print a double-sided page this time and that took quite a bit of faffing about before I figured out I just had to put the stack from the output tray back into the feeder printed side down, but same end up and voila! it worked. Took 6 tries though because the printer was refusing to print color and that made it difficult to figure out where the color that wasn’t there should have been. Eventually I got the old ink cleaned off the printer heads, ran a test print on regular paper, and got the thing printed with no further problems. My 2.5 year old Lexmark S300 managed the heavier cardstock just fine. So having printed it out I then had to score, cut, trim and assemble the project. 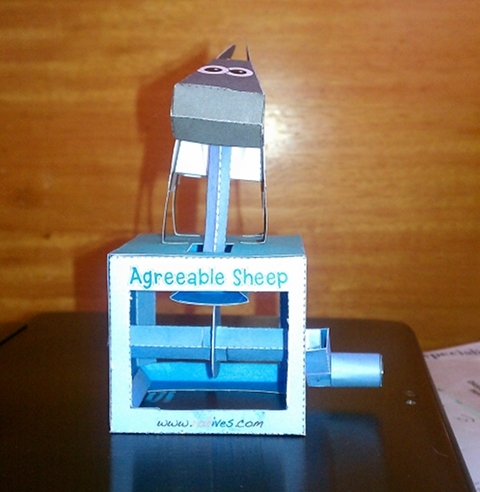 As you can see, I didn’t do a perfect job and the poor thing leans a little, though I’m still not quite sure why. 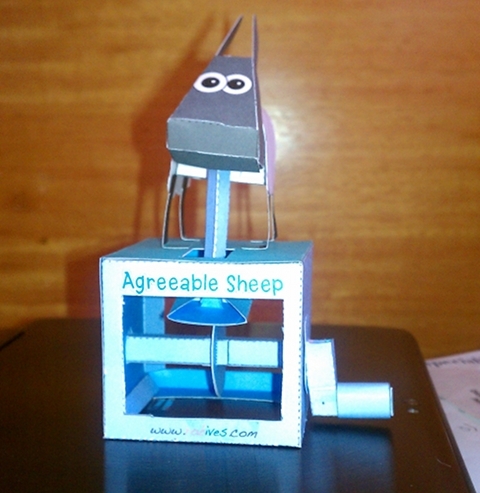 My finished Agreeable Sheep seen from the front–poor thing leans a bit…. 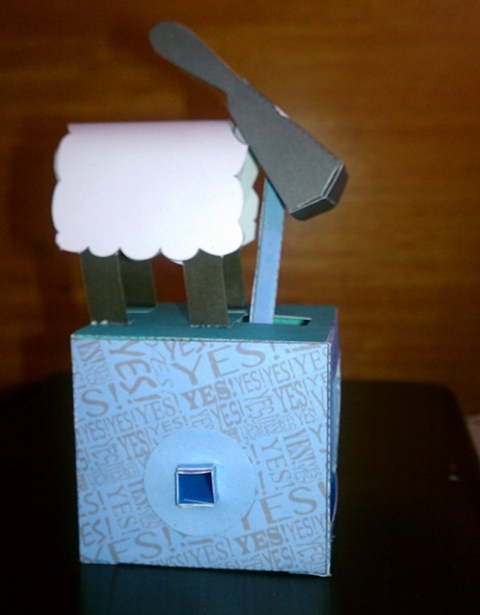 The sheep from above–less noticeably listing to port. One thing I’d noticed with the Simple Crank Slider was that square shafts don’t turn easily in round holes and even less well when the holes are a bit off-shape or -size. So far I’m finding it hard to cut nicely-round holes with the craft knife, but I had noticed on the previous project that running the round end of the chopstick around the inside of the hole made it a bit smoother and slightly wider. This works remarkably well with the heavier cardstock and creates a slight lip around the edge that makes the hole a little sturdier as well as wider and rounder. So I used that technique to “ease” the two round holes on this project. 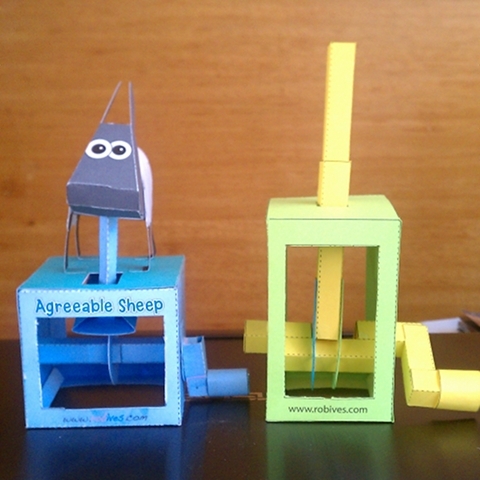 Overall, the heavier paper was good choice here, but in some ways not any easier–it cuts well and holds its shape better, but it resists scoring and folding, which made for unattractive score lines and a recurring need to re-glue and find new ways to hold parts together while they set in place. I also had to use a combination of the stick and liquid glues, since the complexity of this model and the numerous glue joints didn’t lend itself to stick glue alone. I used up a lot of tongue depressors as glue spreaders and got quite a bit of glue on my fingers while I worked, which was a major pain. 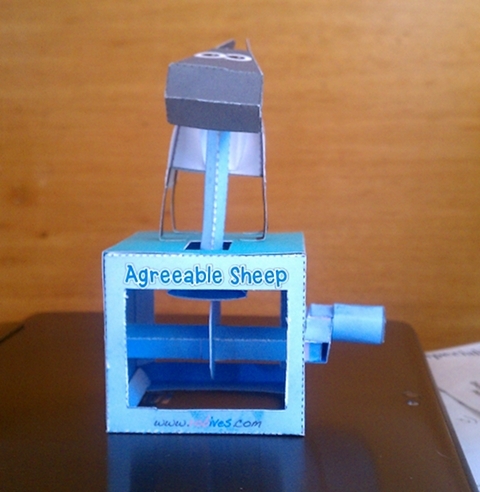 Looking at the right side of the sheep, you can see the square cam shaft, but the hole the shaft rests in is covered by a paper washer that fits very tightly (and has flanges that are glued as well) to the outside end of the shaft to keep it from sliding back and forth in the box. The washer covers the shaft hole and keeps the shaft from wiggling side to side. An identical washer is mounted on the other side, before the crank handle is put on, but this side is easier to see. The cam is actually two matching, unglued pieces that are fitted onto the shaft the same way as the washers. It goes on unglued (unlike the shaft ends on the Simple Crank Slider that gave me so much trouble on the first project) so the flanges can be glued down separately, pointing outward from each side of the cam for a super-secure positioning on the shaft. The pushrod from the head rests on a cam follower (the scoop-shaped object just below the top of the box) that is weighted with a penny. I think a US penny may be a bit too light for this, since the cam follower didn’t always come down and rest on the cam as it should have. A nickel might have been better. Or I just didn’t get the pushrod-follower-head geometry quite right. 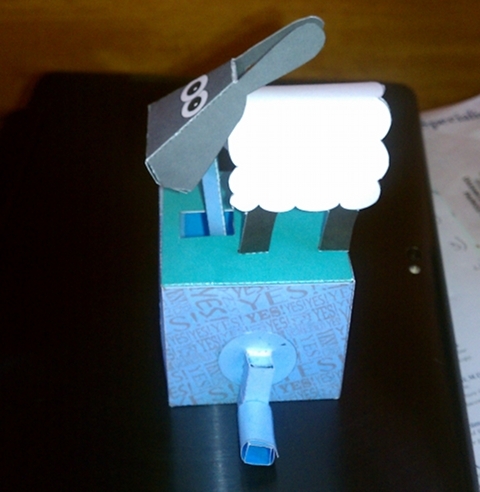 I had more success with the cuts on this model, but you can see that some of the score marks on the folds are rough. May be my scissors are dulling already or the straight edge was no longer smooth, or the paper was just harder to score, I’m not quite sure which. What I did notice was the paper resisted folding, even where it had been scored, and tended to pop back up if not glued down pretty hard. I had to re-glue most of the box joints with liquid glue applied with the edge of the cut tongue depressor/spreader. But the heavier paper didn’t get as wet as the lighter paper did, so it may be the best working combinations are heavy paper/liquid glue or light paper/stick glue. I’ll have to try another project and see. The rectangle in the middle of the rear top support of the box is the cam follower attachment. 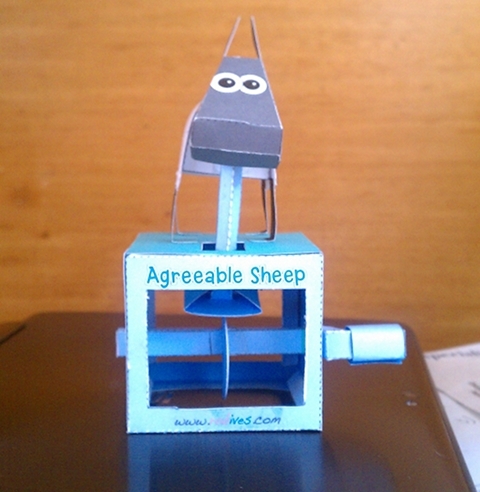 And the sheep still leans. 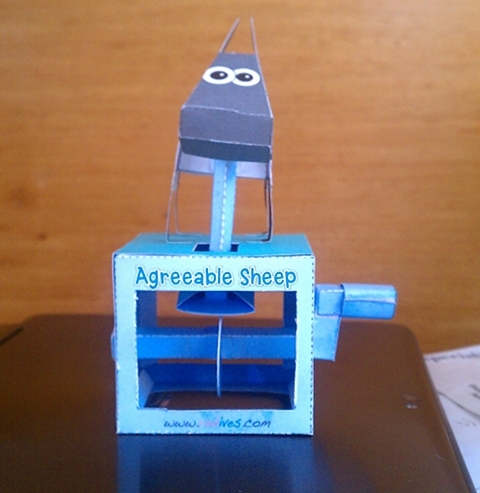 This entry was posted in automata, paper craft, paper engineering. Bookmark the permalink. My husband made a Ewe Boat that has a very similar sheep rowing a boat! It’s super-cute. Have you seen these horror-styled paper toys at ravensblight.com? Some of them are automata; all are free! not yet. I’m mostly looking for basic stuff right now, but I’ll check them out.